There are so many traditions in place at AmaraLand. But what do you do when grandchildren grow up and get to old and to big for those traditions? One of those traditions has always been for Grandpa to “Fly” Amara to the car when it is time to go home. This was easy when she was little but as she gets older it gets more difficult for Grandpa to swing her up on to his shoulder and fly her to the car. So this weekend when she turned to Grandpa and asked him to fly her – he told her “No, you are just getting to big to fly.” Her mouth trembled, tears rolled down her cheeks and she begged — just one more time? Grandpa couldn’t disappoint his girl but he did think fast. He explained that he would fly her to the car but that once she turned 6 years old — which is only a few weeks away — then she would be to big to fly. 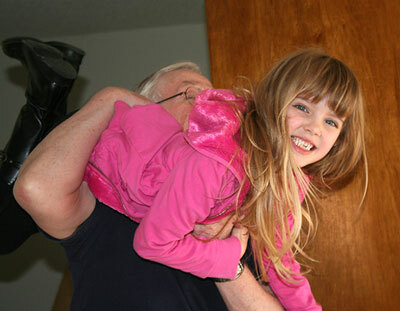 Grandpa flying Amara to the car. So until then Air Amara is still flying out of AmaraLand. This post has been linked to the Grand Social at Grandmas Briefs. This memory was posted in Grandparents, Previously on Amara, Relatives and tagged games, Grandpa, rituals on March 9, 2010 by Grandma Kc. Too precious! It will be a joy to watch with you as she grows. Which will be faster than your own kids did, I promise you! Thanks Barb! It is absolutely amazing how quickly the time is already flying. Seems like just yesterday she was a new born and now she is almost 6!!!!!!!! That is so sweet! You and Rich are the best grandparents! I’m so glad Marzie has you close by to make these wonderful memories with. She is very lucky to have such a wonderful Aunt and Uncle as you and Mark. 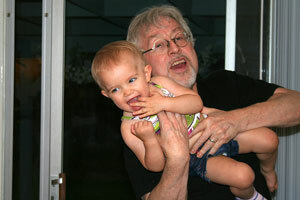 He is a wonderful Grandpa and they just love playing together! Amara is SUCH a pretty girl…at ANY age! Aw, that’s so sweet that it made her cry that the tradition might be over. Sometimes it’s tough getting older (for us, too, that’s for darn sure). I’m sure there will be GREAT new traditions to replace the flying. Thanks for linking up to GRAND Social!